Blade construction: Large Sun'nobi style Tanto of Hira-zukuri, Iori-mune. Wide in Mihaba, Less degree of tapering toward the tip of Kissaki which is swelling in full. 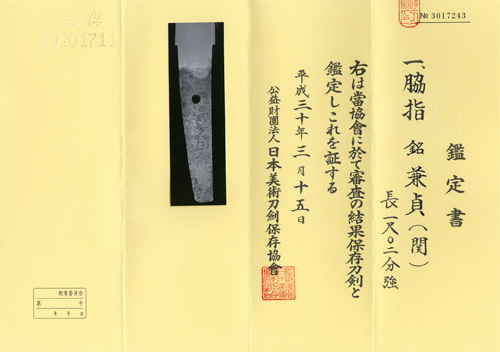 This is a typical example of Tanto shape in circulation during End Muromachi period. (click HERE for higher resolution image of the entire blade). Forging(Hada): Forging is conspicuous Itame-hada mixing with Mokume in places and Masame ware appears mostly along back ridge Mune. Sparkling effect of Ji-nie granules lays over the surface that creates black gleaming lines of Chikei. Temper(Hamon): Hamon is a bit on stronger side Ko-Nie hard metal granules, well-matching on both side, starts with large Gunome of Koshiba on waist then wide Suguha with a slight undulating indication, some Gunome-ashi emits toward the cutting edge. The interior of temper is filled with frosty crystallize area with an indication of Ashi that emits toward the cutting edge. Yubashiri-like Muneyaki quenching temper is perceived along back ridge of Mune. Temper of tip(Boshi): Temper of boshi forms large circle turns back deeply that connects to Yubashiri-Muneyaki on back ridge. Tang(Nakago): The tang is UBU original. Greatly slanting left (Ō-sujikai) file marks. Double bevelled shallow Kurijiri heel shape. One peg hole of Mekugi-ana. The large two inscriptions of uninhibited signature appears in front as KANESADA 兼貞. During the middle battle ages in Mono province, the remarkable sword maker group KANESADA 兼貞 appeared in Hachiya (now Kami　hachitya, Hachiya-cho, Minokamo-city), guessed 5 generations were active throughout Muromachi period. The 3rd gen. KANESADA 兼貞 with Uemon-no-jo 右衛門尉 title who enjoyed Izumi-no-kami 和泉守 reportedly belonged to the 1st gen. KANESADA 兼定. He has been evaluated as a superior sword maker next to KANESADA 兼定, KENEMOTO 兼元 and KANEAKI 兼明. The subject work is full of Samurai majesty spirit during the Warning States of period when major powerful clans such as Oda or Toyotomi in Owari, Tokugawa in Mikawa, Imagawa in Suruga, Takeda in Kai and Hōjo in Odawara began rise to power. Hirazukuri-construction was designed working well for cutting through the openings of armor or helmet, Itame forging ware of functional mixture with hard and soft steel was designed for durable construction, Suguha tempering was carefully quenched for the most supreme sharp performance and "Muneyaki" was designed for defending against hard hitting. This prominent powerful wakizashi had been treasured by brave Samurais in generation and still remains very good condition for the passage of 500 years or even more.